Burnett, L., Terwilliger, N., Carroll, A., Jorgensen, D. and Scholnick, D. (2002) Respiratory and acid-base physiology of the purple sea urchin, Strongylocentrotus purpuratus, during air exposure: Presence and function of a facultative lung. Biol. Bull. 203, 42-50. Terwilliger, N. B. and Ryan, M. (2001) Ontogeny of Crustacean Respiratory Proteins. Am. Zool. 41, 1057-1067. Decker, H., Ryan, M., Janeicke, E. and Terwilliger, N. (2001) SDS induced phenoloxidase activity of hemocyanins from Limulus polyphemus, Eurypelma californicum and Cancer magister. J. Biol. Chem. 276, 17796-17799. Terwilliger, N.B. and Dumler, K. (2001) Ontogeny of decapod crustacean hemocyanin: Effects of temperature and nutrition. J. Exp. Biol. 204, 1013-1020. Decker, H. and Terwilliger, N.B. (2000) COPs and robbers: putative evolution of copper oxygen binding proteins. J. exp. Biol. 203, 1777-1782. Terwilliger, N.B., Dangott, L., and Ryan, M. (1999) Cryptocyanin, a crustacean molting protein: Evolutionary link with arthropod hemocyanins and insect hexamerins. Proc. Natl. Acad. Sci. USA, 96, 2013-2018. Terwilliger, N.B. (1999) Hemolymph proteins and molting in crustaceans and insects. Amer. Zool. 39, 589-599. Brown, A.C. and Terwilliger, N.B. (1999) Developmental changes in oxygen uptake in Cancer magister (Dana) in response to changes in salinity and temperature. J. Exp. Mar. Biol. Ecol. 241, 179-192. Terwilliger, N.B. (1998) Functional adaptations of oxygen-transport proteins. J. exp. Biol. 201, 1085-1098. Brown, A.C. and Terwilliger, N.B. (1998) Ontogeny of hemocyanin function in the Dungeness crab, Cancer magister II. Hemolymph modulation of hemocyanin oxygen binding. J. exp. Biol. 201, 819-826. Durstewitz G. and Terwilliger, N.B. (1997) Developmental changes in hemocyanin expression in the Dungeness crab, Cancer magister. J. Biol. Chem. 272, 4347-4350. Durstewitz G. and Terwilliger, N.B. (1997) cDNA cloning of a developmentally regulated hemocyanin in the crustacean Cancer magister and phylogenetic analysis of the hemocyanin gene family. Mol. Biol. and Evolution 14(3): 266-276. Terwilliger, N.B. and Durstewitz, G.D. (1996) Molecular studies of the sequential expression of a respiratory protein during crustacean development. In “Molecular Zoology: Advances, Strategies and Protocols”, ed. Ferraris J. and Palumbi S. (Wiley-Liss, New York), pp. 353-368. Baker, S.M. and Terwilliger, N.B. (1993) Hemoglobin structure and function in the rat tailed sea cucumber, Paracaudina chilensis. Biol. Bull. 185, 115-122. Terwilliger, N.B. 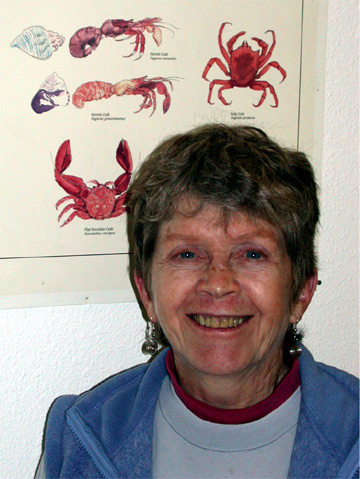 and Brown, A.C. (1993) Ontogeny of hemocyanin function in the Dungeness crab, Cancer magister: The interactive effects of developmental stage and divalent cations on hemocyanin oxygenation properties. J. exp. Biol. 183, 1-13. Brown, A.C. and Terwilliger, N.B. (1992) Developmental changes in ionic and osmotic regulation in the Dungeness crab, Cancer magister. Biological Bulletin 182:270-277. Marine invertebrates demonstrate a rich diversity of form and function of their oxygen transport proteins, reflecting how the evolution of new proteins resulting from gene duplications and subsequent mutations is an important process in the adaptive ability of organisms. The hemocyanin gene family provides a fertile opportunity to explore new proteins with new functions, and we are currently studying three related proteins that play separate and significant roles in the developmental physiology of the Dungeness crab, Cancer magister. We are interested in understanding the differential expression and functions of these proteins during crustacean development and molting as well as in response to environmental factors including temperature, salinity and oxygen availability. Hemocyanin reversibly binds oxygen at its highly conserved copper-oxygen binding sites and supplies the crab tissues with oxygen. Our studies on expression of hemocyanin subunits from megalopa to adult crab have indicated that there are dramatic changes in subunit composition and oxygen affinity. These changes are correlated with developmental changes in salinity tolerance and ion regulation. We are currently investigating the role of hypoxia in hemocyanin expression in crustaceans at both the cellular and the organismal level. Cryptocyanin closely resembles hemocyanin in sequence, but it lacks several critical copper-binding amino acids and has lost its ability to bind oxygen. Its presence in high concentrations, particularly at specific times in the molt cycle, suggests it has been exploited to carry out new functions. We are examining changes in expression of cryptocyanin mRNA and protein during the molt cycle and the role of cryptocyanin in forming a new exoskeleton. Additionally, we are studying the dynamics of synthesis of hemocyanin and cryptocyanin at the molecular, tissue and organismal level, including differential responses to hormonal regulation. Phenoloxidase, a third member of this protein family, functions in sclerotization of the new exoskeleton after molting as well as in immune defense. Its copper-oxygen binding sites are similar to those of hemocyanin, but it is an intracellular protein, found in circulating hemocytes. Hemocyanin itself has phenoloxidase activity, along with potential anti-microbial activity, which suggests additional functions in response to environmental stressors. Sequence comparisons at the mRNA and genomic level are underway as part of our continuing investigations into the evolutionary and functional relationships among these proteins.